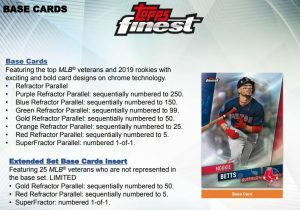 Base Cards – Featuring the top MLB veterans and 2019 rookies with exciting and bold card designs on chrome technology. – Purple Refractor Parallel: sequentially numbered to 250. – Blue Refractor Parallel: sequentially numbered to 150. – Green Refractor Parallel: sequentially numbered to 99. – Red Refractor Parallel: sequentially numbered to 5. – SuperFractor Parallel: numbered 1-of-1. NEW! 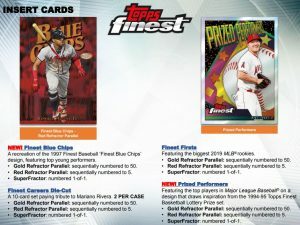 Finest Blue Chips – A recreation of the 1997 Finest Baseball ‘Finest Blue Chips’ design, featuring top young performers. Finest Firsts – Featuring the biggest 2019 MLB rookies. NEW! Prized Performers – Featuring the top players in Major League Baseball on a design that draws inspiration from the 1994-95 Topps Finest Basketball Lottery Prize set. 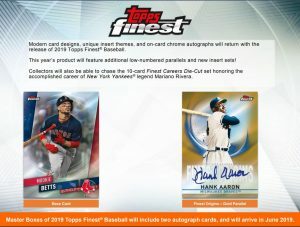 AUTOGRAPH CARDS – Continue to find TWO on-card autographs in each master box of 2019 Topps Finest Baseball. Finest Autographs – Featuring ON-CARD autographs on chrome technology. – Green Wave Refractor Parallel: sequentially numbered to 99. – Orange Wave Refractor Parallel: sequentially numbered to 25. – Red Wave Refractor Parallel: sequentially numbered to 5. 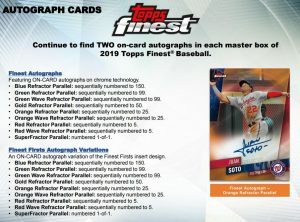 Finest Firsts Autograph Variations – An ON-CARD autograph variation of the Finest Firsts insert design. NEW! Finest Blue Chips Autograph Variations – An ON-CARD autograph variation of the Finest Blue Chips insert design. NEW! Prized Performers Autograph Variations – An ON-CARD autograph variation of the Prized Performers insert design. Finest Careers Die-Cut Autograph Variations – An autograph variation of the Finest Careers Die-Cut insert design. Sequentially numbered to 10. 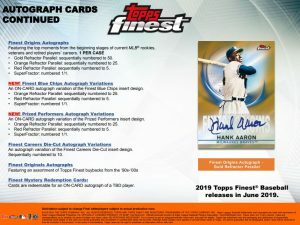 Finest Mystery Redemption Cards – Cards are redeemable for an ON-CARD autograph of a TBD player.